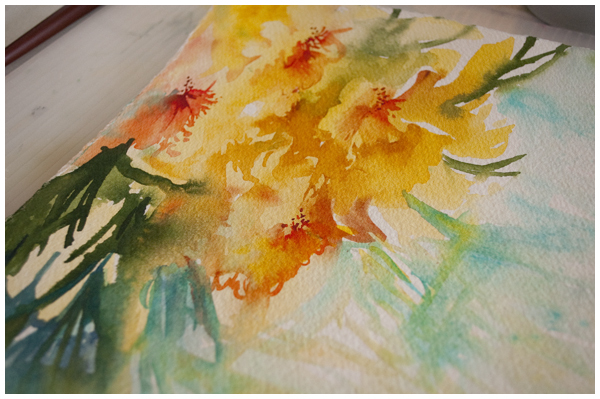 Sunshine in the Studio: Painting for the Joy of It! This morning I was struck by a flash of sunlight - a photo of a cluster of brilliant alstromeria - and I just had to paint it. So vivid and full of life, and spring is so long in coming here in northern British Columbia. Yesterday we skied for an hour, surrounded by snow-carpeted forest. I am so thankful that I can use colour to light up my day! My children were also inspired by the painting vibe in the studio and pulled out their paints too. My son dashed off a quick flower for me - he's seven - before getting back into Lego mode. He's much more of a builder/tinkerer than a painter, and that's okay! And my nine-year-old daughter painted her own sunflower very carefully. She was highly offended when I grabbed a brush and teasingly aimed it at her page. She is not interested in hearing any advice on painting from me! (Mums never know anything, do they?) She did follow my suggestion to add some purple to her page - yellow and purple are such lovely complements to each other. Sometimes I forget that painting is supposed to be fun, a joyful exercise. I find that when I do remember, the outcome is almost always better (more successful paintings) and even if they are not, I am more satisfied in my life as artist. How to Paint Trees in Watercolor: The Secret Formula (or not).